With little fanfare the FAA announced earlier this week that it was going to give owners of airplanes in need of ADS-B gear a $500 incentive to equip. The plan has been widely praised by aviation organizations from AEA to the ZBAA, and those organizations are encouraging everyone to spring into action and be one of the first 20,000 to get the federal incentive. After all, they argue, you’re going to have to equip anyway, why not get $500 taken off your bill? That seems to make sense, but there are several elements to the story that nobody is talking about, if they’re even aware of them. Soon after the FAA established the ADS-B mandate, which required just about every airplane flying in the United States (save those that stay outside of protected busy airspace), there were a lot of airplane owners who openly announced their intention to wait a good long while. They were hopeful, they said, that prices of ADS-B gear would come down and that new features would arrive. We didn’t think so, but we were wrong. The prices have come down, the products have improved, L-3’s terrific Lynx product with built-in display is just one case in point, and other features, including connected cockpit functionality, as seen in Garmin’s equally impressive GTX 345, keep coming. And prices, as you no doubt know, have come down by several thousand dollars for a capable In/Out ADS-B box that will connect to a display, or even an iPad. This all sounds good, and it is, but there are a couple of wildcards in the mix. The first is the question everybody is asking: Will prices fall even more? When at Sun ‘n Fun a few months ago the FAA unveiled a program where it essentially waved a wand and certified an experimental avionics product; the agency created in the consumer’s mind at once an uncertainty about what exactly a certified avionics product is and what other avionics products the FAA might grant its newly minted short-form certification. I don’t know the answer to either question, and I’m not sure the FAA does either. I’m not sure that the FAA put two and two together on this one, but the implications were clear to me immediately that the agency had opened Pandora’s box and that we might be entering a new era of much easier certification on a lot of different kinds of products. Owners have to be asking themselves if indeed the FAA plans to allow Cert-Lite on ADS-B gear, why would they spend a lot on a nice box when in six months or a year a lot less dough might get them ADS-B-compliant? While it’s probably my civic responsibility to advise everyone to equip right away, I understand why some would choose to hold off, at least until the FAA makes a categorical statement that it would never ease certification requirements for ADS-B gear. It would make sense that it wouldn’t, as the cert standards are pretty lofty and the performance required to get the benefits the agency envisions for the system down the line require great reliability and accuracy. Then again, one could make that same argument about any Cert-Lite approvals for critical safety gear, like the attitude indicator the agency approved at Sun ‘n Fun. The idea behind the whole movement is that the benefits of digital gear are worth the slight risk that such equipment will lead to accidents. I have no doubt that the major makers of experimental avionics gear are up to the task, but once the FAA opens that door, it’ll be hard for it to say who can and can’t walk through it. There’s a solution, but the time might have passed for the FAA to implement it. Instead of offering $500 rebates to the first 20,000 to equip, they should pay $10,000 to everyone to equip, let’s say up through mid-year 2018. It would have cost a fortune, but it’s not like the entire program hasn’t cost several fortunes already. If the FAA wants folks to equip with gear that’s an add-on to equipment we already have (Mode-C transponders) in order for the government to save it billions of dollars in the long run (which ADS-B will surely do for it), then the least it should have done is shouldered more of the burden for a program that not one voter ever approved. The whole rebate program, on the heels of an even more paltry effort to help owners get loans for ADS-B equipage, smells like desperation. Why is the FAA deciding to do this in the middle of 2016? That’s one question I can answer. It’s because the rate of ADS-B adoption is glacial and it shows no sign of accelerating. So the FAA fears that a popular uprising of inaction by aircraft owners in failing to equip will result in a colossal embarrassment to the program. The fear is understandable. From a pilot’s perspective, what would I do? I’d be tempted to take the $500 and go to the shop, but I might put off that call for a little while to see what happens. Whether you call it procrastination or weighing one’s options, it probably isn’t the right thing to do, as January 1, 2020, the date for universal compliance, draws ever nearer. But it’s the human thing to do, and I’m afraid that $500 won’t be enough of a nudge to counteract that understandable impulse to do nothing until we have to. After all, for a lot of us airplane owners, $5,000 or more, in some cases much more, is a lot of dough, and it is, after all, our money. So it’s our decision. As we sit and contemplate this ADS-B mess, the FAA continues to sweat. We’ll see if it can buy its way to success, and relief, at the rate of $500 a pop. I’m doubtful. We’ll see what happens. When making a decision on ADS-B OUT, aircraft owners need to consider installation cost and scheduling. As we get closer to the deadline there will be more demand for installers and the cost of installation is likely to go up. ADS-B OUT installation is a major alteration, which needs either an STC or a field approval, and a form 337 and IA approval. One thought, tax dollars that would find your $10,000/airplane is also “our money”. Further there are few pilots compares to citizens so for greater good, I’m not sur I can agree that is where the money should go. We’d probably be better off spending $10k/ea training new pilots as the industry is short and would also create more demand and economies of scale for new equipment. 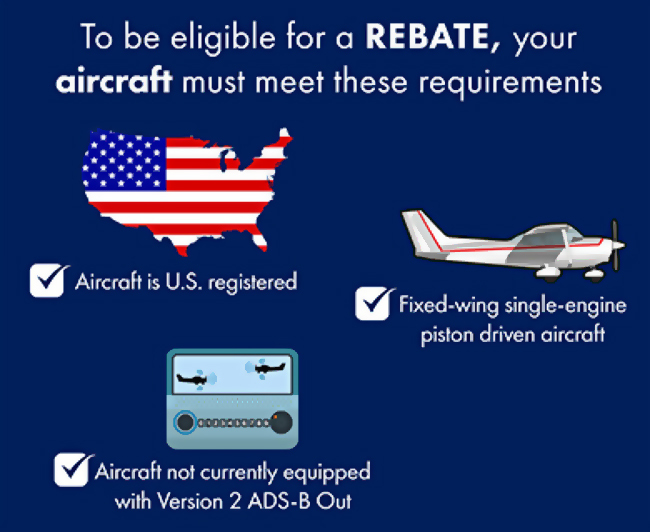 Interesting take on the FAA rebate program. I have to echo Bill w’s comment about “our money being tax money. Considering there are 200,000 registered GA aircraft in the US, do we really want to increase our country’s debt by $2 billion dollars by giving every GA aircraft owner $10,000?